Peru’s Skylodge Adventure Suites is inviting fearless folks to truly hang around with intrepid individuals. 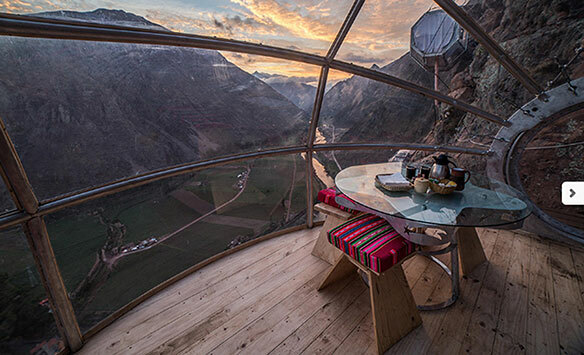 The unusual lodging option has three mostly glass “luxury capsules” visitors sleep in that are attached to a rockface 400 metres above ground in Andean Peru’s Sacred Valley. Climbers – who will always be attached to a steel cable that serves as a “lifeline,” safely holding them in place if they slip – must be at least nine years old and accompanied by a guide trained in vertical rescue on a journey up that will likely last three to four hours. Zip-lines ranging in length from 150 to 700 metres in turn enable them return to the valley floor after they exit the lodge, which opened in 2013. The capsules – made from what’s described as “aerospace aluminum and weather resistant polycarbonate” and which are 24-feet long and eight high – have a walled-off bathroom, beds, lights that use solar energy and a dining area. Meals can be eaten on an outdoor platform. Skylodge Adventure Suites – which for obvious reasons doesn’t want guests to become intoxicated – doesn’t have a bar. The Sacred Valley is famed both for dramatic scenery and its many Inca ruins. And, she continues, Skylodge Adventure Suites is likely great for team-building and trust-building exercises for up to eight people.